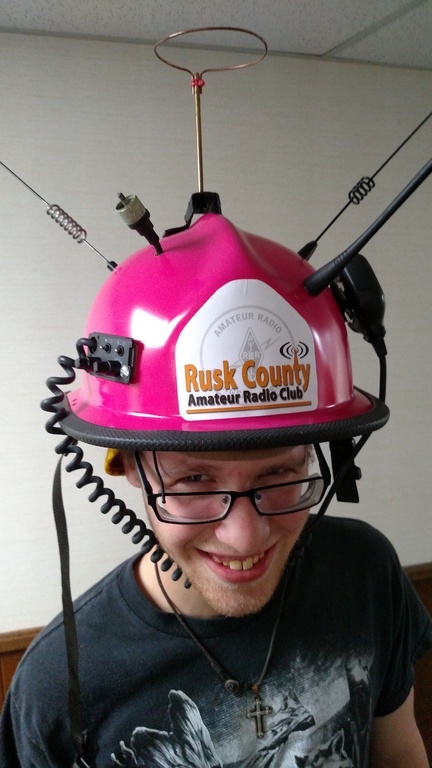 Rusk County Amateur Radio Club: Hat entered in "Paint the Town Pink"
Hat entered in "Paint the Town Pink"
The Rusk County Amateur Radio Club entered a custom-designed hat in Henderson's 2016 "Paint the Town Pink" cancer event. The fundraiser is organized by the Henderson Fire Department and co-hosted by the Henderson Chamber of Commerce and ETMC Henderson. The event will be emceed by David (W5CWT). The club's hat, designed and donated by Craig (AG5RI), will be one of nearly 30 hats modeled by city and county officials before being auctioned to the highest bidder. Each table can tip their servers as well as the hot models. All the funds raised by the event are distributed by the fire department to local residents who have a loved-one battling cancer. Paint the Town Pink is from 5:30-7:30pm, Tuesday, October 4th at the Henderson Civic Center. The event is free and includes a hot dog supper.